In this unusual and fascinating study, Elizabeth Berne DeGear draws on both biblical studies and psychoanalytic theory to interpret the role of the standing stone erected by Joshua in the sanctuary at Shechem. The presence of a listening stone in the sanctuary distinguishes the ritual space in Joshua 24, yet this religious symbol has received little scholarly attention. DeGear begins with the question: What is this numinous feminine presence serving as witness to the people’s covenantal relationship with their God? Comparing this stone’s function with the function of other covenant stones in the Hebrew Bible and throughout the ancient Near East, DeGear illuminates both the power of the symbol and its dynamics in the people’s religious development. In psychoanalytic mode, DeGear goes on to show how humans create and use symbols differently at various positions along the path to maturity. Her study presents a new perspective on how covenant symbols in the Hebrew Bible function in the development of the communities using them. The present analysis of this one biblical symbol offers scholars and students of biblical and religious studies the tools to engage in psychologically informed consideration of covenant. With its focus on sanctuary, symbol and psyche, DeGear’s exploration of the stone extends from the world of ancient Israel to today’s worship communities, where the Bible itself is used as a covenant symbol. What emerges is a picture of how the standing stone and other mediating symbols function in the religion of communities in the Bible and beyond. Elizabeth Berne DeGear is an interdisciplinary scholar teaching in the fields of biblical studies and depth psychology. She is a chaplain for the Center for Urban Community Services in New York City. She presented at the Psychology and Biblical Studies Section sessions in Atlanta in 2010 and San Francisco in 2011. Categories: Book Review | Tags: covenant, DeGear, Joshua | Permalink. Categories: Book Review, Society of Biblical Literature | Tags: Review of Biblical Literature, Theory | Permalink. 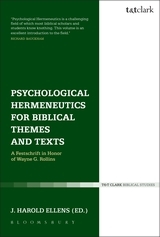 Bloomsbury publishing has announced the availability of a paperback version of Psychological Hermeneutics for Biblical Themes and Text, a collection of essays by members of the Psychology and Biblical Studies Section edited by J. Harold Ellens. Created to honor Wayne G. Rollins, this volume offers the most comprehensive history of psychological biblical criticism to date, as well as showcasing a variety of applications of psychological methods to individual texts. In addition to Ellens, contributors include Paul N. Anderson, Schuyler Brown, Donald Capps, Hal Childs, D. Andrew Kille, Andre LaCocque, Raymond Lawrence, Michael Newheart, Ilona Rashkow, F. Morgan Roberts, Frederick H. Shively, and Ralph Underwood. The book was the subject of a panel discussion at the 2013 Annual Meeting in Baltimore. For more information, see the Bloomsbury Press website. Categories: Book Review | Tags: J. Harold Ellens, psychological hermeneutics, Wayne Rollins | Permalink. This book is a supplement and sequel to To Each Its Own Meaning, edited by Steven L. McKenzie and Stephen R. Haynes, which introduced the reader to the most important methods of biblical criticism and remains a widely used classroom textbook. This new volume explores recent developments in, and approaches to, biblical criticism since 1999. Leading contributors define and describe their approach for non-specialist readers, using examples from the Old and New Testament to help illustrate their discussion. Topics include cultural criticism, disability studies, queer criticism, postmodernism, ecological criticism, new historicism, popular culture, postcolonial criticism, and psychological criticism. Each section includes a list of key terms and definitions and suggestions for further reading. The chapter on psychological criticism was written by D. Andrew Kille, currently Chair of the Psychology and Biblical Studies Section, and a longtime contributor to the field. Along with an introduction to the method, he includes examples of how it might be used to interpret the story of Adam and Eve in Genesis 2 and 3, and offers a glossary of terms and a bibliography of key works. Similar treatments are given to each of the other perspectives. The book offers a basic introduction to the numerous forms of biblical criticism that have arisen in the last thirty years or so, and provides guides for further study. Categories: Book Review | Tags: Biblical Criticism, John Kaltner, Kille, Steven L. McKenzie, Theory, Westminster John Knox Press | Permalink. Van Os’s book is a prodigious achievement, breaking ground simultaneously in three fields: historical Jesus research, psychological biblical criticism, and early church studies. It is enhanced by his impressive command of European and American scholarship, by the originality and incisiveness of the project, and by the careful and meticulous composition of his argument. You can find the full review at the RBL website; this is a full-length of the book noted here in an earlier post. The book was featured in a book review session at the 2011 Annual Meeting in San Francisco. Categories: Book Review | Tags: Annual Meeting 2012, Review of Biblical Literature, Rollins, van Os | Permalink. Van Os, Bas, Psychological Analyses and the Historical Jesus (London: T&T Clark International, 2011). This book is a prodigious achievement, breaking ground simultaneously in three fields: historical Jesus research, psychological biblical criticism, and early church studies. With an impressive command of European and American scholarship, Bas van Os initiates us into the world between the historical Jesus and earliest Christianity with an intriguing thesis: that the effect of the former on the latter provides compelling psychological, anthropological, demographic, and sociological insight into the historical Jesus. Categories: Book Review | Tags: historical Jesus, Jesus, New Testament, van Os | Permalink. 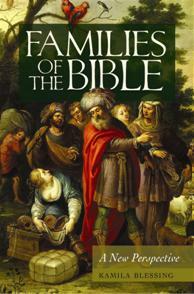 Blessing, Kamila, Families of the Bible: A New Perspective (Westport, CT: Praeger, 2010). Reinterpreting the Bible through Family Systems Theory, this fascinating exploration shows how the theology of creation, restoration, and salvation can be meaningfully and uniquely understood through the lens of the biblical family. Categories: Book Review | Tags: Blessing, family systems | Permalink.